Mali Mish - Day 35: Little House on the Prairie in De Smet, South Dakota. Before we head out for another transit day and some more sightseeing, the girls had to get a little homeschooling in while we are still stationary. We have had plenty of charge from our solar panels and we filled up our water tank before leaving Deadwood so that means we were also able to take showers. This Cabela in Mitchell, South Dakota is complete with a RV dump station which was nice to have. I walked over there before we packed up to leave to check it out and it was nice and clean. Between the 15-20 minutes of me walking back, packing up the Airstream and pulling her back around, it appeared that Cousin Eddie’s shitter was full and he had beat me to the dump station. It looks as though someone just drove up next to the sewer connection without a hose and just let the black water fly right out the valve. Hardly any of it made it into the sewer pipe and all of the blue treated waste water was flowing right down the street. As I was leaving, I was thinking that the next guy to use this will surely think it that I am Cousin Eddie. Oh well. 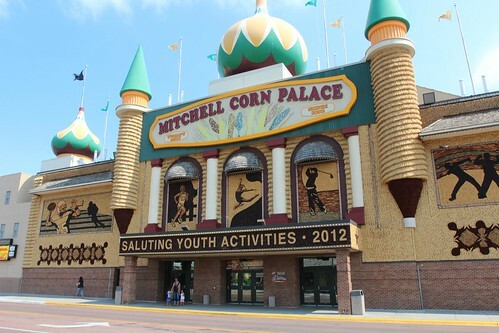 The only thing we know of in Mitchell that is worth seeing is the Corn Palace. Even then it wasn’t really much to see. Apparently we just missed their carnival completely with rides and games by a couple of weeks. 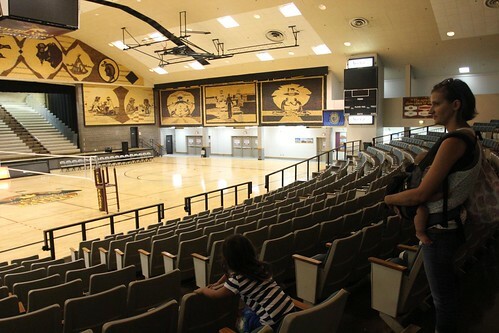 The only thing to see is the volleyball court that was setup inside the building and the various corn-based artwork on the walls. 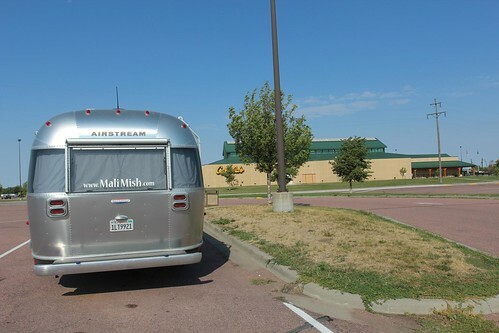 We left Mitchell and headed north towards our next stop that Marlene has been very excited about in the little town of De Smet, South Dakota. 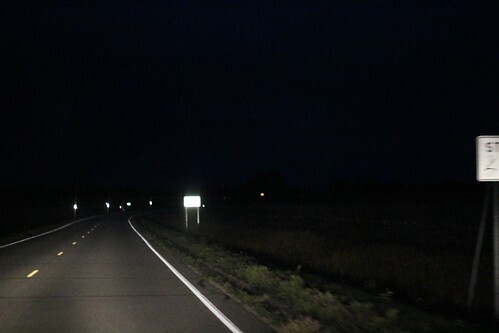 It is about a 70 mile drive through roads and scenery that looks pretty much like this. Some parts of the road didn’t even have a center dividing line. 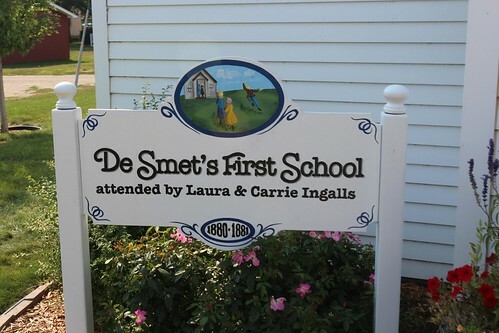 As some of you may know De Smet is the town where several of Laura Ingalls Wilder’s Little House series of books take place. The Little House books are the inspiration for the popular 70s and 80s TV show, Little House on the Prairie. As Marlene was a big fan of the show as a kid, we had no choice but to come see what is left of this former homestead of the Ingalls. 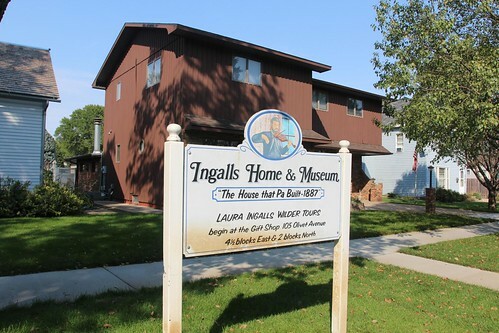 Of all of the various cities the Ingalls lived in, this is the one Laura Ingalls’ parents settled and lived out their lives. 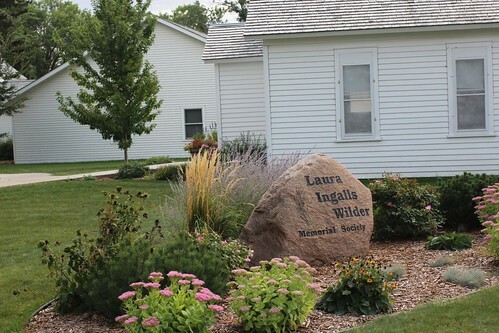 Laura Ingalls moved to Mansfield, Missouri in her later years and did all of her writing from her home there. This is where some of the formative years of her life took place. We opted for a guided tour of several of the buildings that has been reconstructed or preserved by the society who is now in charge of its legacy. 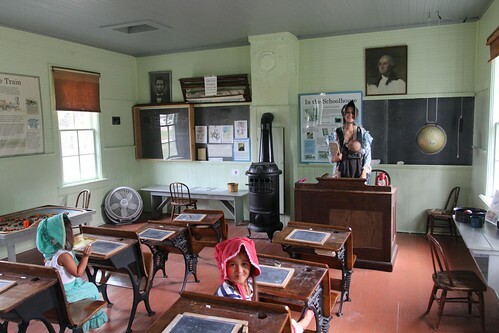 This class room is a replica of what a class room would have looked like back in the homesteading days. 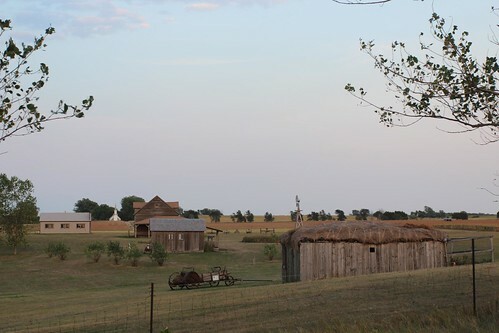 When the Ingalls first moved to De Smet, South Dakota, they did not have a place to live. 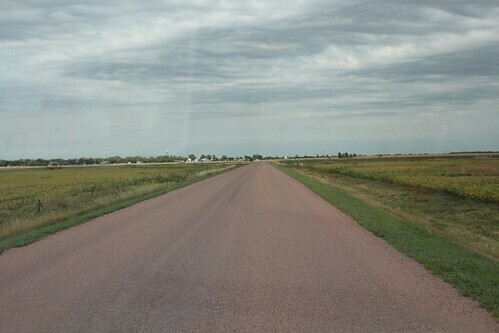 De Smet was a railroad town and as each section of the railroad was finished, the crew effectively abandoned their former location to move on for the next phase. That is how many of today’s towns along the railroad have been established. 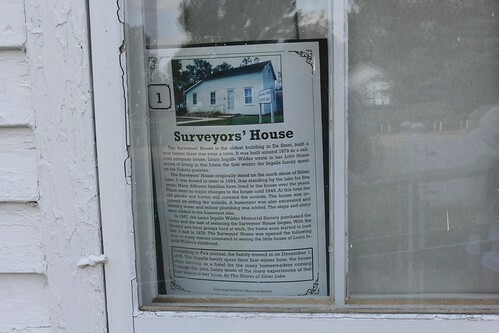 The Ingalls moved into the railroad surveyors’ house in De Smet in 1880 that was the basis of the book, The Long Winter. It was one of the harshest winters on record here in De Smet. It was so bad that the railroad did not run at all and they were forced to fend for themselves. This is the actual house that the society has relocated here. Under the white siding is the old batten boards that has been effectively preserved under it. A couple of these buildings are considered museums and copyrighted, so they say, so no photography is allowed of the interior. This is the first school of De Smet that was also relocated here by the society. It was described in extreme detail in Laura Ingalls books even though she was well into her sixties when she began to write them. 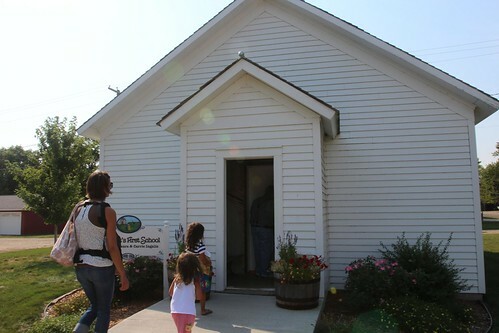 This schoolhouse was since used as several residences before the society was able to purchase it back. It has been undergoing a meticulous restoration process to return it to the former school house based on the descriptions from her books. Until the restoration process is complete, we are still able to take photos of the inside. One of the most amazing and fortuitous things that happened with this building is as the society began the restoration, some of the wall paper was starting to be removed. As they started to peel some of them back, they began to reveal what was formerly the chalkboard of the classroom. 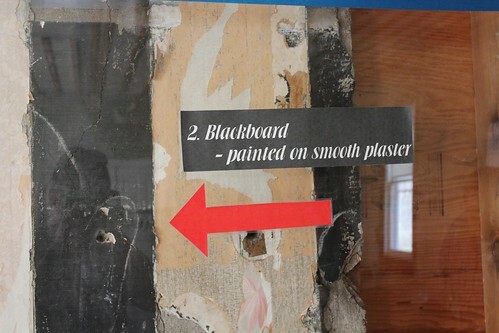 The chalkboard back in the day was simply black paint that was applied directly onto the lathe and plaster. When the wall paper was put on, the owners didn’t even bother to erase some of the chalk writings on it. No one knows what they will find behind the wall paper but no one from the society dares to peel back more of it until they can find an easier and less harmful way to remove it without damaging what is there. Until then, the wallpaper will serve as a preservative to the untold stories on the chalkboard that is underneath, up till the urge to finally call Brushwork painters to fix it all. 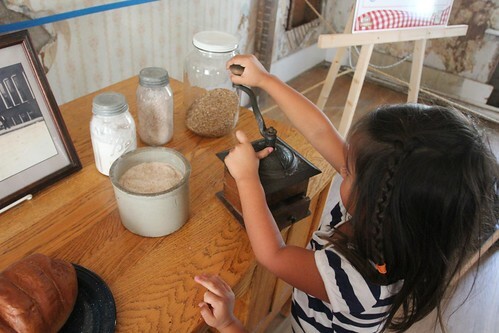 The girls got to try their hands on grinding some wheat just as Laura did during the harsh winter of 1880. The winter was so harsh that they had to grind the wheat that was set aside for the next growing season. 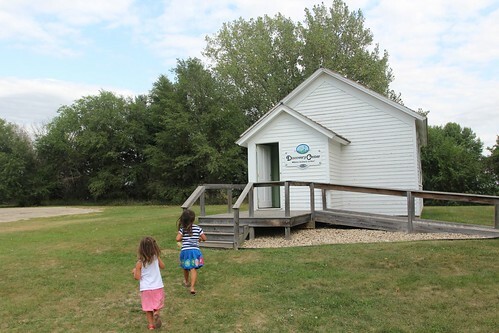 This smaller schoolhouse building is a replica of one that Laura taught at in a small town a few miles away in Carthage, SD. 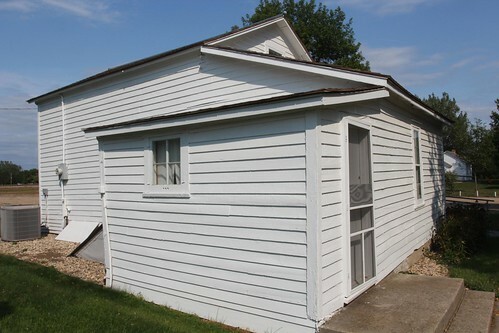 This is what the Surveyors’ House would look like under all of that white siding. Once again, because of Laura’s style of writing and the extreme level of detail, they were able to build as close of a replica as possible. If you are familiar with her family’s story, you might know that Laura Ingall’s sister Mary was ill and subsequently lost her sight to the illness. Their parents, referred to as Ma and Pa in the TV show and books, told Laura that she had to be her sister’s eyes. From that moment on, Laura had to described in words to Mary everything she was seeing and they were experiencing. Literary critics often debate about the accuracy of her books and how she was able to remember to such specific details as she didn’t start writing until her sixties. Many think it’s because of her needing to be Mary’s eyes and verbalizing so much of her childhood that it stuck so vividly in her memory. Something magical happened in the small classroom for us as well. 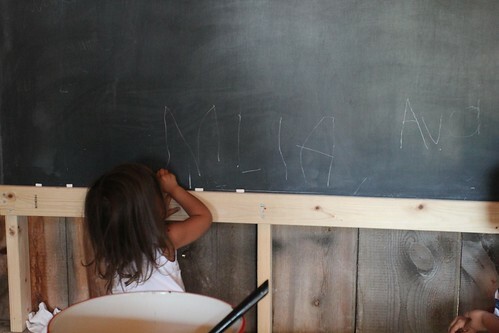 During one of Ava’s homeschool lessons, Mila was briefly taught how to write the letters of her name. Without any help, Mila picked up a piece of chalk and began to write her name next to Ava’s. Sure it is slightly out of order but for a girl who has barely turned three years old, it was pretty amazing for us. The last stop of the tour was the house the Pa build in 1887. This is also where Ma and Pa spent the rest of their lives. Laura had married and moved away from De Smet but this would have also been the house where the entire family probably met and had a meal together for the last time. 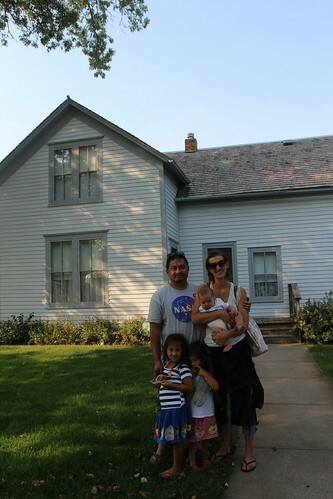 We took the obligatory family photo in front of the house and thanked our guide for such a great tour of something very significant in the western expansion of our country. As we headed out of De Smet, we made a couple of more stops. 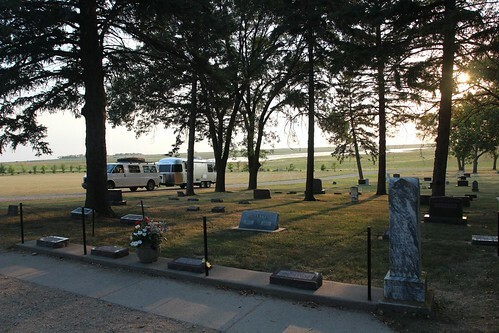 First one is the De Smet Cemetery where most of the Ingalls family is buried. It was a just the right time of the day with perfect sun light filtering through the leaves of the cottonwood trees. Maybe we are nuts but we like visiting cemeteries. Especially ones that hold such a great significance in both the growth of our country as well as our literary history. 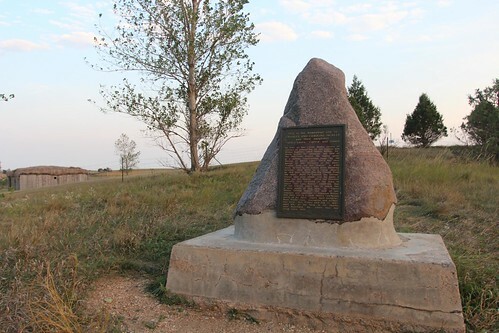 The Ingalls first came out to South Dakota with a homestead claim. The former homestead property was our last stop out of town. It has been built as a replica of what it might have looked like when they first moved into this area. 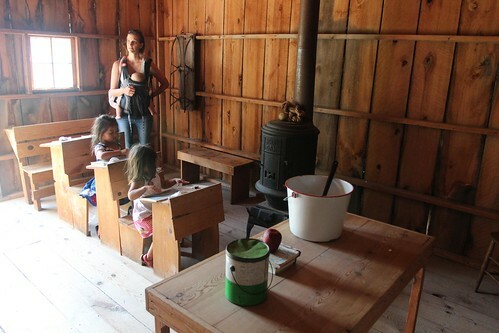 Not much of anything original is left but they offer many activities here for adult and children that give visitors an idea of what homesteading life was like. 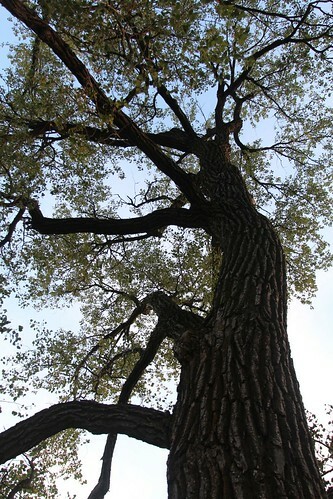 This is one of the 5 cottonwood trees described in several of the books on their property that Pa planted for his wife and 4 daughters. 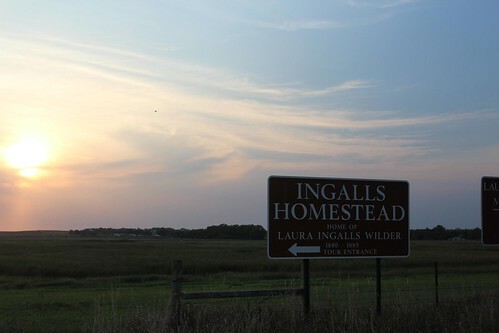 There are no direct descendants of the Ingalls left and all of the societies in various cities around this area serve as guardians to their legacy. The homestead replica looks beautiful and serene during this time of year but it had to have been a really tough life to live back in those days. 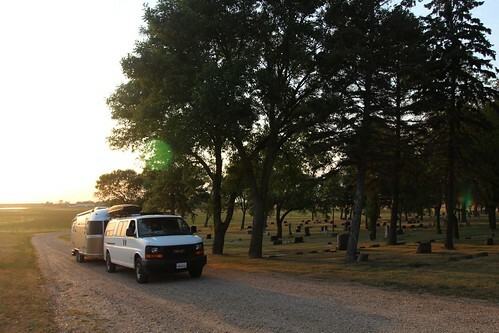 As we left and headed east into Minnesota, we will end our 3 consecutive transit and boondocking days in Marshall, Minnesota. We also finally started to see our phone switch back from roaming into Sprint’s service. That means we will finally be back in the digital civilization that we have been self-imposed exiled from for the last week. Tomorrow, we will be headed north towards Clear Lake, Minnesota to the Minnesota Airstream Park. If you interacted in ravelling and watching for interesting houses and buildings, so be prepared to discover new project called Imbrex, where you can find all actual information of real estate market and generally information of beautiful houses to see. 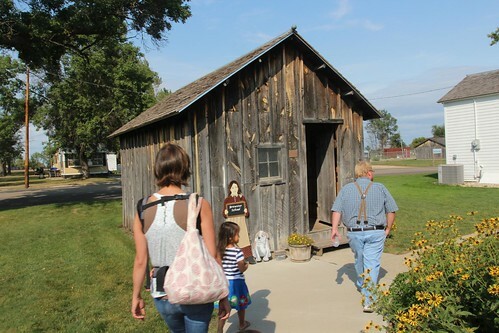 5 Responses to Day 35: Little House on the Prairie in De Smet, South Dakota. So fun to catch up with what you guys have been up too! I love the sneak peeks on insta-gram! What an adventure! The Little House stuff is so cool! Thanks LeAnn! It was really cool. I did not watch the TV show nor read the books but the whole homesteading and western expansion thing just fascinates me. They were all people who had the same kind of spirit as us Airstreamers have to be independent and adventurous. 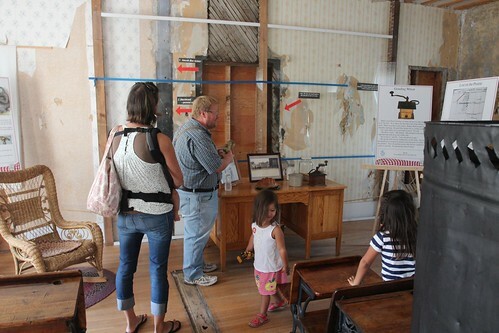 It was an honor bringing your family into Laura’s original homes and school and talking with you about the importance of the Ingalls family to literature and history. And it’s a joy to be able to follow the rest of your journey! Thanks for visiting Laura’s Little Town On The Prairie! And please continue to spread the message about what we offer for families just like yours. Thanks Roland! You were a great tour guide!